50 BLOGGERS ARE GIVING AWAY 50 SETS OF T-FAL COOKWARE OVER THE NEXT 30 DAYS! I am excited to share this giveaway with all of my readers. I am partnering with Cooking Planit and joining 49 other bloggers in giving away a 12-piece set of T-fal Cookware. You can watch for my giveaway to go live on September 10th, but in the meantime, you really should check out all of the participating blogs and enter for a chance to win. You can only win once, but your odds will certainly be better the more that you enter. That's 50 chances to win. DETAILS: Contests open to US only. Limit one-winner per household/per family from the 50 blogs participating in the promotion. 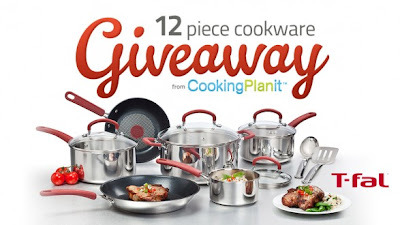 If an individual is the winner of more than one giveaway, they will receive only one set of cookware and an alternate winner will be chosen for the other set(s). Mary - They are each giving away one set - so 50 sets.